The photocopy reproduced above came along a 35 mm copy of The Tree of Life in its shipping cases (two shipping cases holding a total of eight 2000 ft. reels). 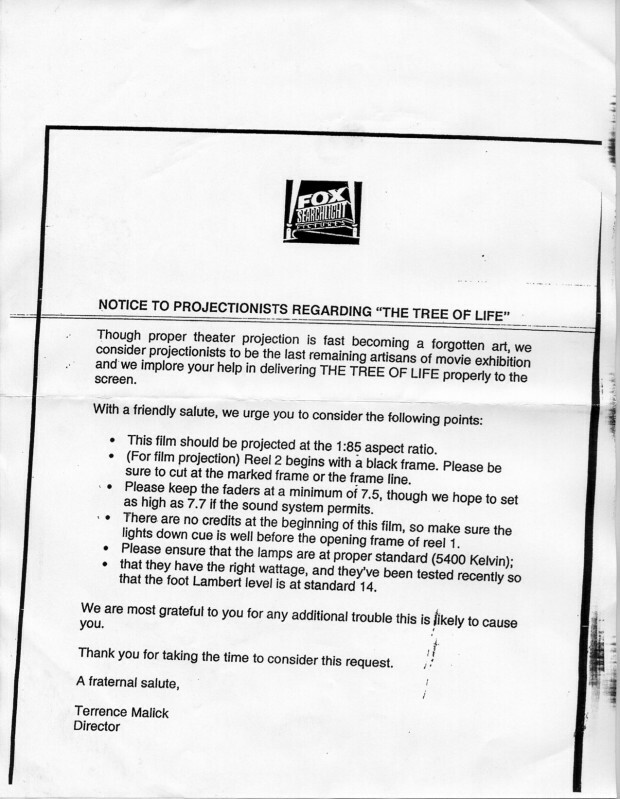 The explanations I provided earlier were updated accordingly: see “Terrence Malick’s alleged instructions to projectionists” for more details. 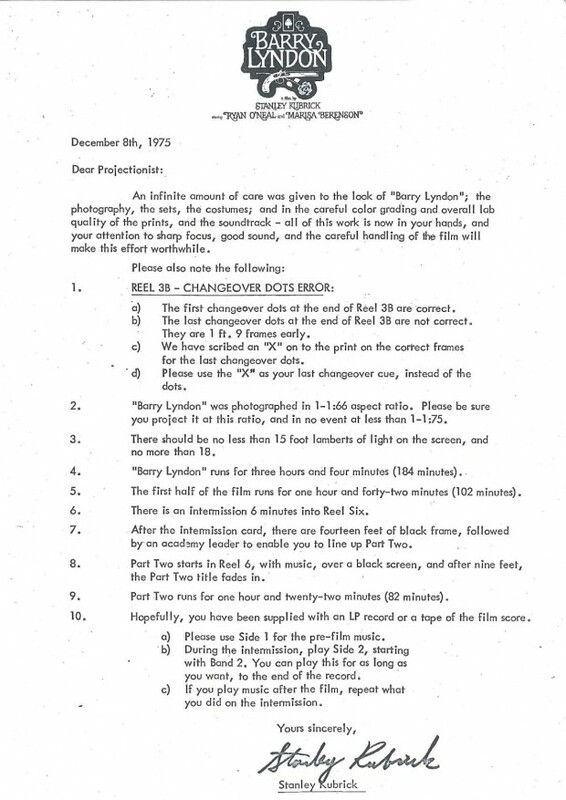 Below, I offer some more comments, along with another example of such “notice to projectionists” written in 1975 by Stanley Kubrick for the exhibition of his film Barry Lyndon (retrieved from Glenn Kenny’s blog Some Came Running). Though proper theater projection is fast becoming a forgotten art, we consider projectionists to be the last remaining artisans of movie exhibition and we implore your help in delivering THE TREE OF LIFE proprerly to the screen. This film should be projected at the 1:85 aspect ratio. (For film projection) Reel 2 begins with a black frame. Please be sure to cut at the marked frame or the frame line. Please keep the faders at a minimum of 7.5, though we hope to set as high as 7.7 if the sound system permits. There are no credits at the beginning of this film, so make sure the lights down cue is well before the opening frame of reel 1.
that they have the right wattage, and they’ve been tested recently so the foot Lambert level is at standard 14. We are most grateful to you for any additionnal trouble this is likely to cause you. 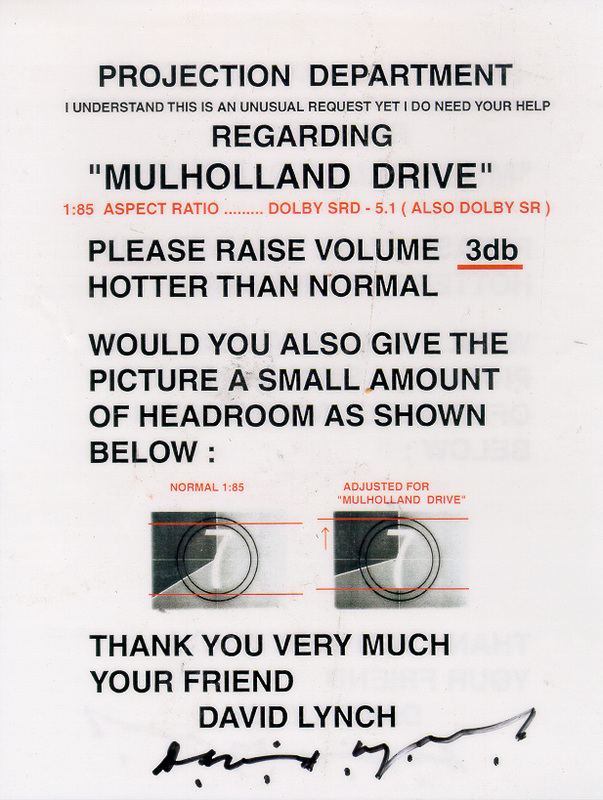 Apparently, this notice is good for film projection as well as digital projection (as for the precision in parenthesis “(For film projection)” specifying where to cut the film at the very beginning of reel two). The 35 mm copy is full frame (1.33:1). It appears the film was shot full frame, although intended to be presented with the 1.85:1 aspect ratio (in the letter, the 1.85:1 ratio is improperly expressed as 1:85). It would be nice to have a confirmation from another source about this. I’m also curious to see how it will be transferred on DVD and Blu-ray. 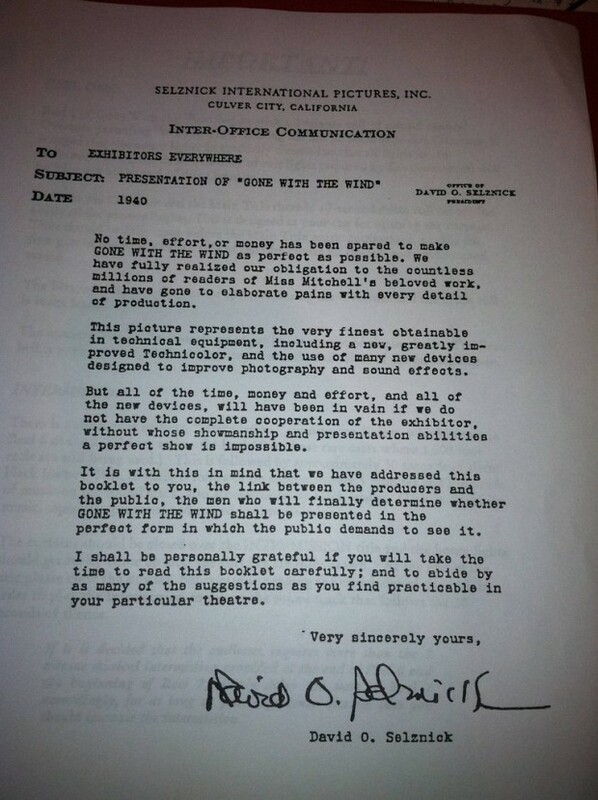 [UPDATE–July 22, 2012] From Reddit: “Behold the original instructions for projecting “Gone With The Wind”.” by Reddit user DiMyDarling, July 21, 2012. Link to imgur.com (for original photos of the instructions, 4 pages document).